We're Off On Our Outback Adventure! I'll be taking a break from blogging while we head off on our Outback Adventure to the Northern Territory. After the disappointments of having to cancel the trip twice last year, we are actually going. Everything's booked and the packing has begun. We head off on Wednesday morning nice and early. If I find some free WiFi while we're away, I'll try to do a post or two. If not, I'll have lots of photos to share when we get back. 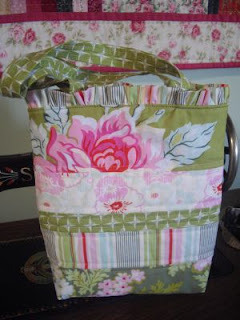 Before I go, I just want to thank Nicky of Farm Girl Stitching who sent me this lovely bag. I won it in her recent giveaway. The bag is so much nicer in person and the colours are gorgeous. Thank you Nicky. 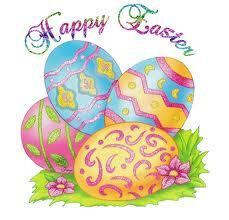 Hope you get lots of chocolate! 2011/2012 H Grade Cricket Grand Final! As I mentioned in my post here, the boys had to stay in for as long as they could for the 68 overs. By tea break they were 3 for 91 with only 30 or so overs left to go. That meant Whittlesea still had to get the other 7 players out and then make more runs than Diamond Creek. Whittlesea conceded defeat thus giving Diamond Creek the premiership. The Whittlesea team were great competitors. Everyone played so well during the final. This team consisted mainly of junior players (this was the senior competition). 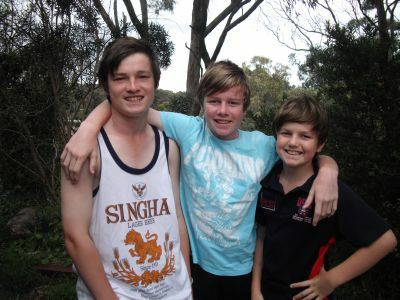 There were three Under 16 players (Mitchell, Dale and Jake, above) and five Under 14 players. For these boys it was their first season playing seniors. 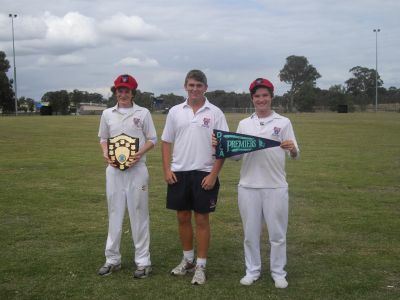 What a great start to their seniors cricketing! 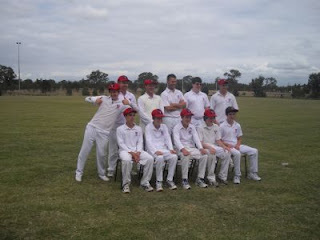 Diamond Creek 2011/2012 H Grade Premiers! 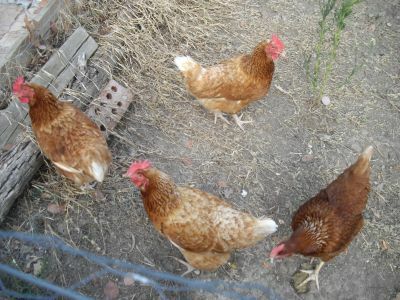 Many of you will know that I collect chickens. These are "My Girls". Every time I go out to the backyard they come running just in case I have some scraps for them. Yesterday when I went out, no-one came running. I checked in their run and all I found were hundreds of feathers. A rotten fox had got to them in the daytime. I hope they didn't suffer too much. Austin came 3rd in the high jump which made him happy. He would have been happier if he had managed his personal best height. He'll have to try again next year. Here here is with his friend Will (left) and Daniel (centre) at the medal presentation. Nelson did his best but unfortunately didn't get any medals this time. He did come 4th in the 200 metres. Here he is doing long jump. 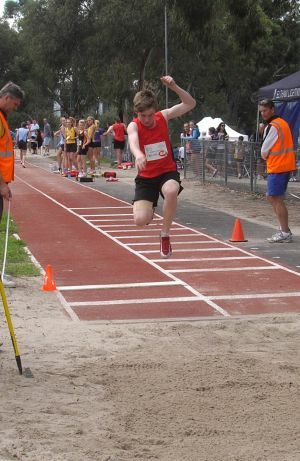 Austin doing his long jump. Now for Mitchell's cricket Grand Final. What a nerve wracking match. 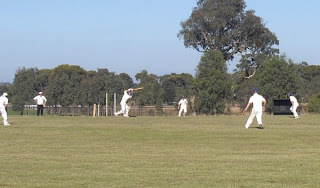 Mitchell's team Diamond Creek (DC) were playing Whittlesea. On Saturday, Whittlesea had DC all out for 107 runs! Oh dear! 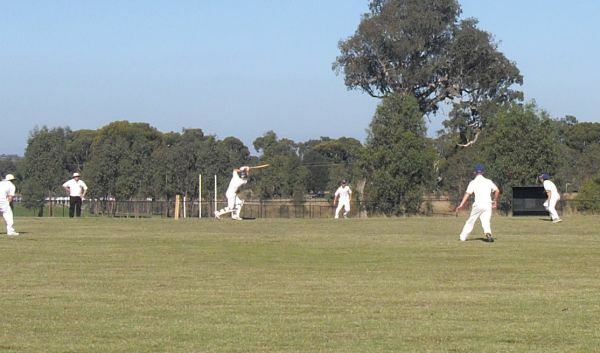 But yesterday, DC fought back and got Whittlesea out for 94! Diamond Creek has won the first innings. Next Saturday the match continues. Noel and Dean - Official Scorers! Next Saturday will be another tense match. Hopefully I can report back with good news! 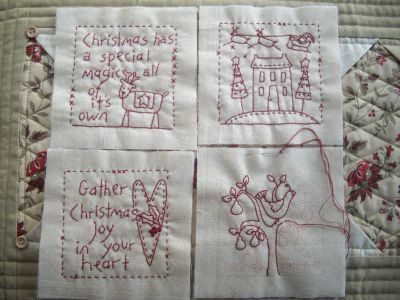 I received these four fat eigths from Gail of Patchwork with Gail B. They are Echino by Melody Miller. I've got an idea of what I might do with these. Thank you Gail. Finally, a lovely little package arrived in the mail today. A cute little "Happy House". 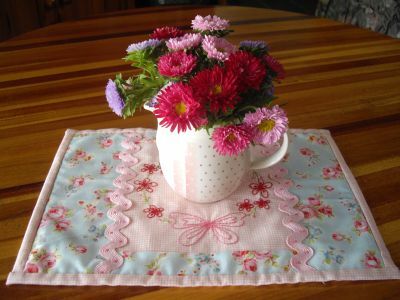 It was from Kathy of Sew Happy House. It was one of the first lot of giveaways in the Friends With Benefits Sew-Happy Housemates Swap. Thank you Kathy. 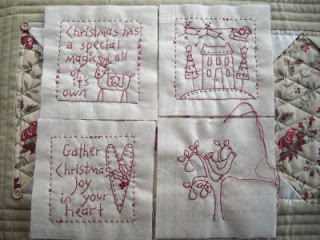 Last night at the FNSI I started stitching the second block of my Merry Mistletoe BOM. I was able to finish it off at Little Athletics this morning. Yesterday was the House Athletics for the Secondary School. Mitchell and Austin are in Meers House (Blue House). Meers' theme for the day was Super Heroes. 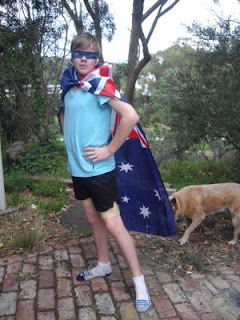 Austin went as "Super Aussie" aka John with the Odd Socks! Mitchell just went dressed in blue. 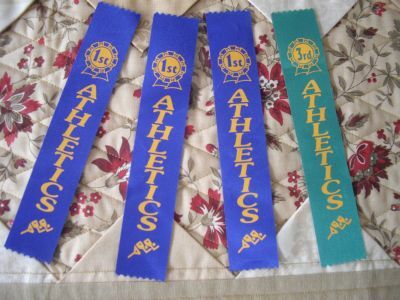 As you know, Austin does Little Athletics and he had a very good day. Three firsts in three events! 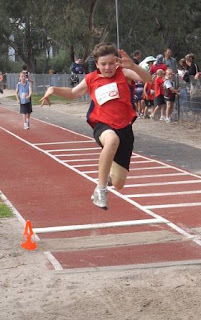 High jump (his speciality), long jump and 100metre sprint. Mitchell came third in the relay. His high jump was cancelled as a storm was coming in. Tomorrow is the big sporting weekend. 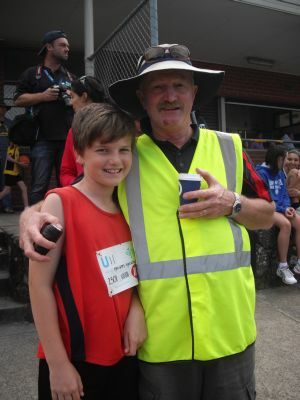 Austin and Nelson at Little Athletics Championships and Mitchell in the Cricket Grand Final. Good luck boys. Do your best! 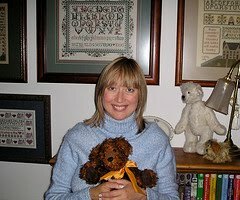 Teddy Bear's Picnic and Friends with Benefits! It's the Teddy Bear's Picnic today and I'm joining Melody and her friends. 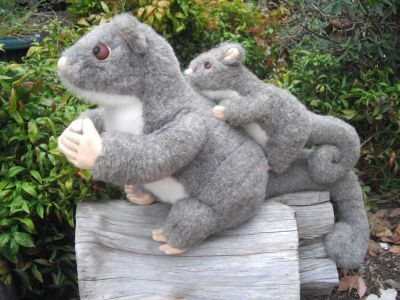 As it's a bit overcast today and the sun isn't out, Ma Possum and her baby have come along. They don't normally come out during the day but they begged me to take them! Ma Possum and her baby came to live with me when I turned 21. They've brought some Anzac biscuits to share with all the other picnickers. Won't you join us! I've signed up for Kathy's Friends with Benefits swap. My partner is Cheryll of Gone Stitchin'. Poor Cheryll was a little disappointed that I hadn't shown any sneak peeks of the special project I am making for her. Being the nice person I am, here are some photos just for Cheryll! 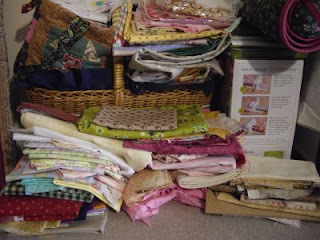 I may or may not have taken some fabric from this pile! 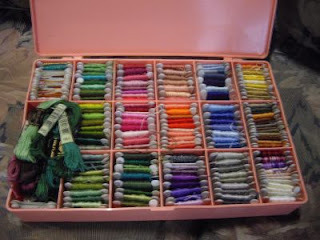 And I may or may not have used some of these embroidery threads! 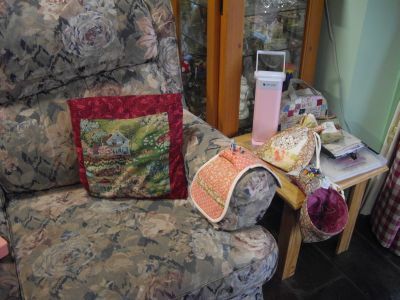 This is my favourite spot for sitting and stitching. Can you see that box on the table Cheryll? Your project just may or may not be in there! 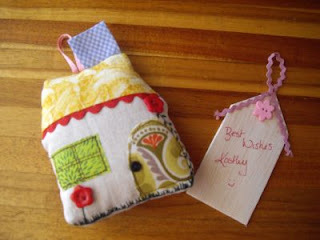 Or it could be in the lovely bag Peg made me. 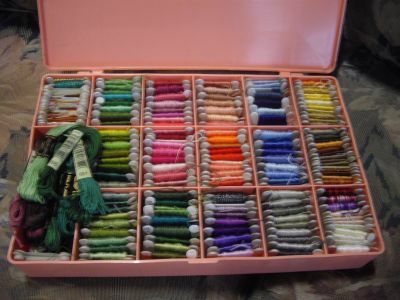 No wait, it could be in my new sewing case! 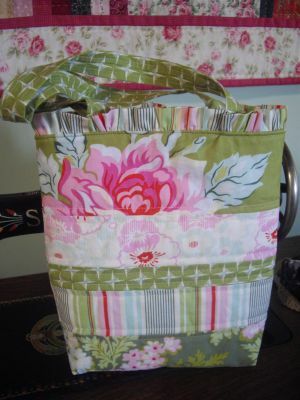 It definitely isn't in the bag with my Tis The Season stitcheries, so you don't have to worry about that bag! I may or may not have spent some time here too! Tonight is my quilting Guild's meeting and I just may or may not work on your project! I hope this post has helped cheer you up and you now have a big smile on your face! hehehe! 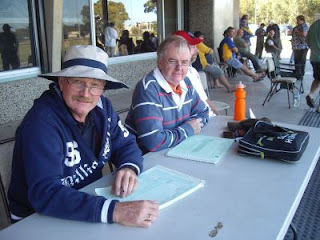 The High's and Low's of Cricket! 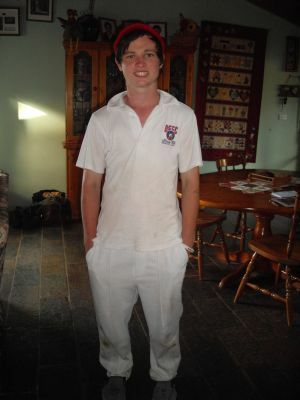 This weekend Mitchell played in two cricket semi-finals. First there was his junior team. They started playing the weekend before last but the match was washed out after 11 overs. Play continued Saturday and Sunday morning. Unfortunately the boys fell in a heap and were all out and that was the end of the 2011/2012 junior season. That was the low of cricket! Now for the high of cricket. Mitchell plays senior cricket on a Saturday afternoon. The senior semi-finals started this weekend. Mitchell's team batted Saturday and he got his highest score ever of 73 before going out. Play continued yesterday afternoon and Diamond Creek won the match! Next weekend is the Grand Final. Another weekend of not doing anything but watching cricket! Oh no, wait! Next weekend Austin and Nelson have Little Athletics Championships! Noel and I will have to tag team at each sport. 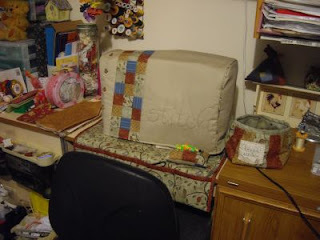 Needless to say, nothing much else was done this weekend, not even a single stitch! Edit: I just found out that the Grand Final goes over two weekends! So it's four more days of cricket! Our big trip to the Outback is finally going to happen! After cancelling our plans twice last year everything is now booked and we'll soon be off. One of my cooking options in the camper is an electric frypan. 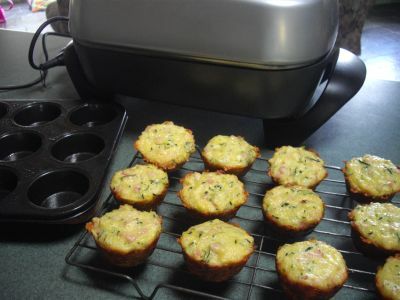 I thought I'd experiment and try to make zucchini slice in the muffin tins. They've come out really well, so zucchini slice will be added to our camping menu! I thought it would be best to have a tryout at home prior to the trip. On the stitching front, I've finished blocks seven, eight and nine of Tis The Season and last night got a fair bit of block ten done. Only two more to go. 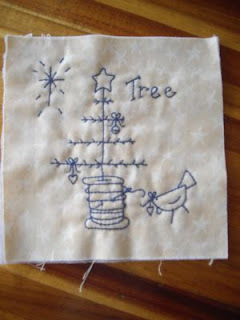 I've also been working on some secret stitching but you can't see that until later. A package arrived today. It turned out to be the latest Spy Kids movie dvd. But I had no idea who it came from. After some investigating, it turned out to be Anorina from Samelia's Mum. Anorina had a giveaway a little while ago and the winner never contacted her. A redraw was done and my number came out. As Anorina already had my address, she thought she would surprise me. The boys will be very excited when they get home from school to see it. 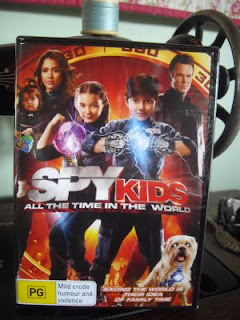 I actually borrowed the dvd from the library last week for them! Thank you Anorina. You certainly did surprise me! Some Sewing and Catching Up With a Blogging Friend! 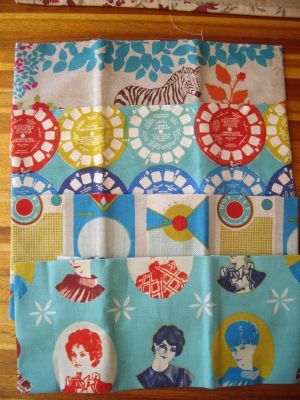 These three fat quarter bags didn't quite make my February OPAM list. 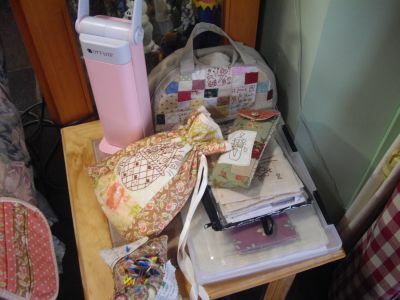 The bags are great for just putting those bits and pieces in. So that's three more presents to put away. I only finished two projects for February. Not very good at all. 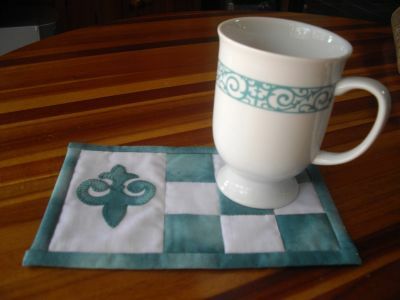 Although I did a lot of preparation for stitcheries and other projects, so at least I did get something done. Hopefully next month will be better. 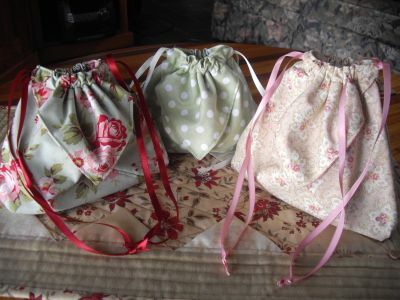 There are three little bags that I worked on yesterday but did not quite get them finished. They will be added to my March total.